Any ballots with inappropriate responses will not be considered. Remember that only (PAID National) members can vote, and yes, you can vote for yourself too. Thank you for your time! 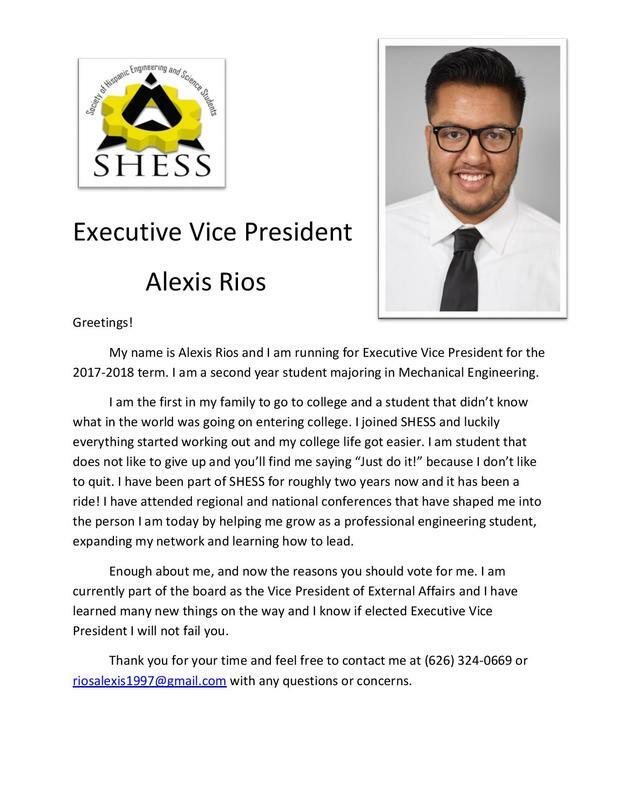 ​If the candidate is an official (submitted SHESS Membership Application AND SHPE Invoice) member, he/she is eligible to run for leadership position for 2017-18 academic year. He/She can nominate him/herself to prepare speech for more than 1 position. Running for the same position twice in consecutive year is NOT allowed. Must be present at all general, special, and board meetings and shall NOT be allowed to miss more than three (3) meetings per term without prior notice and a valid excuse. 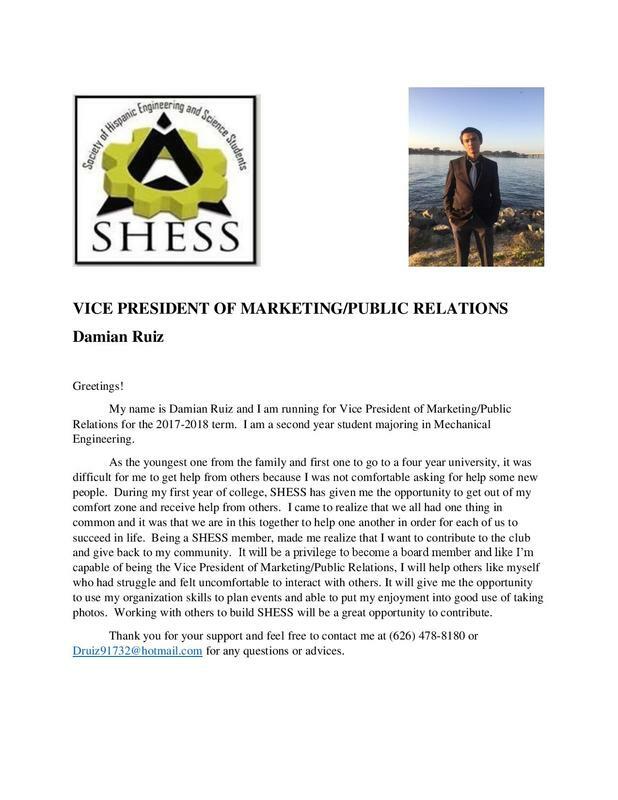 Publicize all SHESS programs and events including but not limited to Speaker Series, socials, professional meetings, outreach activities, and flyers to currently enrolled classes and assist with the preparation and distribution of flyers on campus. Complete all assigned tasks in a timely and responsible manner; shall assume additional responsibilities to otherwise fulfill the objectives of the organization. Shall be responsible for all functions or activities that require logistics, materials, food, supplies, and settings. Share all SHESS, SHPE, ECST, MESA, and Cal State LA events and activities through active social media accounts. Ensure that members have paid their membership dues and they are receiving benefits from SHPE National, and are aware of programs and events throughout the year. Shall write Continuous Feedback Forms (CFF) for End of the Year Report on all programs and events within one week after the event. 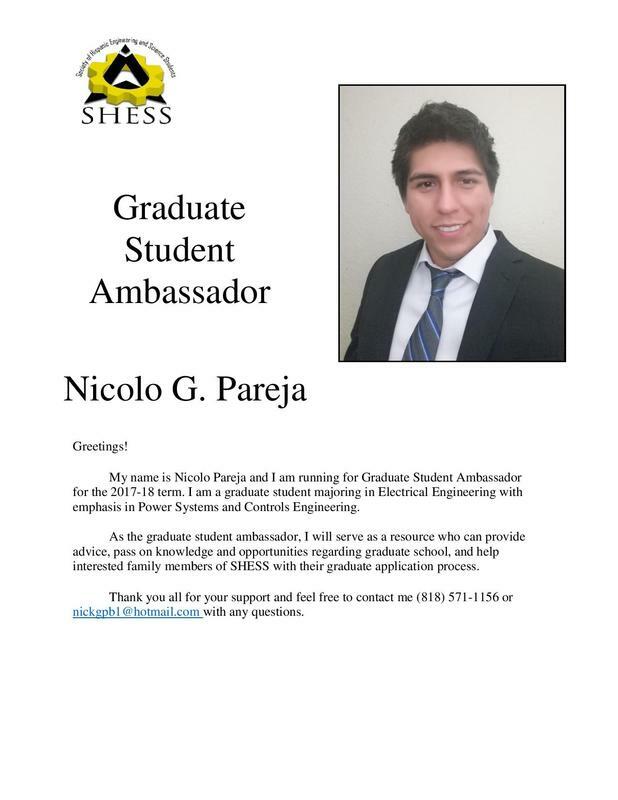 Increase awareness and support for SHESS and its vision within our local community to achieve a closer personal relationship and a spirit of cooperation among Hispanics with technical careers. Shall network with STEM professionals and encourage them to join us at upcoming SHESS programs and events. Establish important partnerships with local, corporate sponsors, and community organizations in matters of common interest. Assist the Executive Vice President in preparing, reviewing, and submitting the End of the Year Report (NRP) in accordance with all deadlines. Shall organize cross-functional networking with other STEM and Hispanic organizations. Create and establish committees as needed (e.g. conference committee, outreach committee). Establish support for national and regional initiatives within the chapter to help achieve SHPE's mission. Research any internships and job opportunities for members and forward emails to the President and Secretary. Shall have one (1) vote on the Executive Board of Directors. Should have served (1) year on the SHESS Executive Board. Shall be the official spokesperson for the chapter, manage the Executive Board of Directors and execute the day-to-day affairs of the chapter. Have the power to call general, special, or board meetings at any time deemed necessary. Chair and preside at chapter board, general, and special meetings. Oversee that assigned tasks are completed in a timely and responsible manner. Lead in the management and business of the chapter and shall set and establish all policy of the chapter and/or other functions or activities under the direction of this organization, subject to the approval of the Board of Directors. Be the point of contact for the organizational and financial matters of the chapter, as well as all other business concerning the chapter according to policies and guidelines set and approved by the chapter. Be one of the two people (the other being the chapter Treasurer) responsible to sign any documents related to financial matters. Shall provide meeting agendas and PowerPoint presentations to each director, prior to the meeting. Collaborate with the Executive Vice President to reserve a space, time, and location for all general, special, or board meetings. Collaborate with the Secretary to read and respond to SHESS emails on a daily basis. Maintain active communication with organization advisor. Must provide current and accurate information for the chapter to the National Office, including bylaws and contact information, as well as verify information for each of the chapter's members. Be part of the Regional Council along with the RVP, RSR and other representatives in the region. Study local problems affecting Hispanic engineers, scientists and technical educators. Identify and encourage nominees for the SHPE Star Awards. Attend Regional, SHPE presidential events, and professional meetings to give presentations. Represent the chapter by maintaining communication with the Regional Student Representative and National Office. Shall attend the Fall and Spring Organizational Development meetings and all other meetings required by the Center for Student Involvement (CSI). Be cognizant of any problematic situations that involve any officer, member, or club activity. Assist the President in all business concerning the chapter and shall act as a President Pro Tem in SHESS related events in the latter’s absence. Prepare and submit the End of the Year Report and proposals as stated in the National Reporting Program. Shall prepare a bound copy of all process, procedures, documentation required for completing the End of the Year Report and proposals. Assist the president in all business concerning the chapter and enforce officer duties and assist fellow officers with projects as needed. Assist the President with scheduling speakers, company and university tours, conferences, and outreach events. Oversee and participate in committees. Collaborate with the President to reserve a space, time, and location for all general, special, or board meetings. Keep board and general members updated of SHPE National and Regional events. 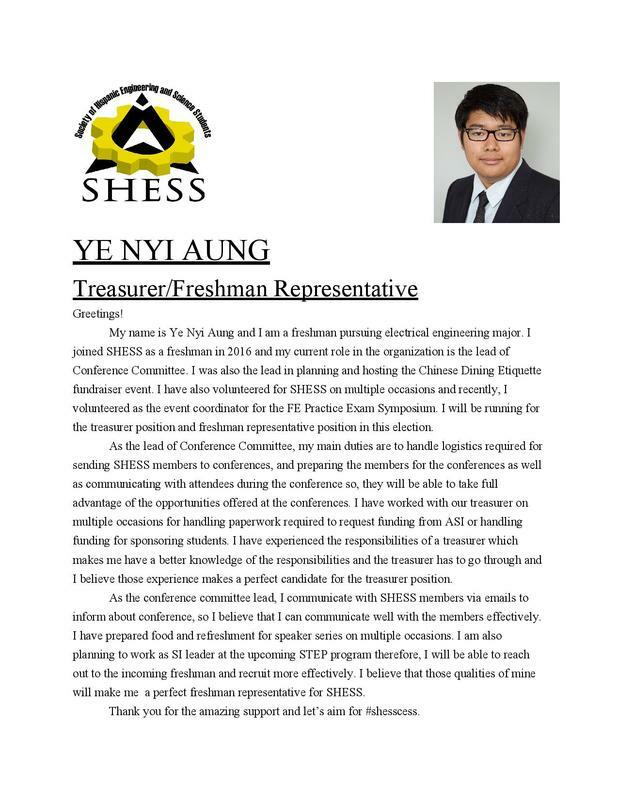 Should have served (1) year on SHESS Executive Board. Be one of the two people (the other being the President) responsible to sign any documents related to financial matters. Shall be responsible for the collection of dues, the disbursement of authorized funds, the arrangement of fundraisers, and the banking and accounting of all organization funds, along with the President. Prepare monthly financial reports listing all liabilities and assets of the organization to the Executive Board and the general membership. Keep records of all money received and disbursed. Shall prepare a bound copy of financial transactions at the end of each fiscal year. Be responsible for presenting monthly budget, annual budget, and complete an annual Financial Report for the fiscal year of operation. Shall be responsible of ordering/ preparing food and refreshments for all of the Speaker Series with the help of the Freshman Representative. Work with the Membership Coordinator to maintain a record of all membership dues. Collaborate with the President to read and respond to SHESS emails on a daily basis. Deliver the “Executive Board of Directors Meeting Minutes” to each director, no more than three (3) days after the meeting. Shall prepare a bound copy of the annual meeting minutes at the end of each fiscal year. Be responsible for tallying the Point System with the Membership Coordinator. Be responsible for keeping an updated list of scholarships, internships and research opportunities for members, and forwarding it to the Webmaster. Email SHESS newsletter at least once a month and maintain board, and members informed of any special events, programs, etc. Check SHESS mailbox on the second floor of the Engineering and Technology (E&T) building mailroom. 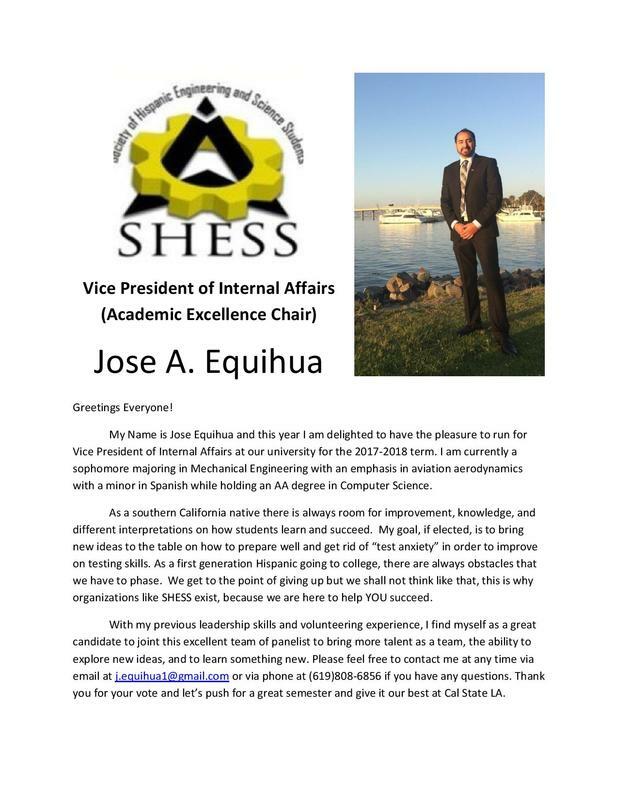 Work with VP of Marketing/Public Relations on SHPE magazine articles, and SHESS newsletter. Shall be responsible for all matters regarding conferences and conference registrations. Shall organize at least 1 “Academic Excellence” event in fall semester to promote academic excellence as related to the chapter’s overall strategy. Shall organize “Academic Olympiad” event in fall semester prior to SHPE National Conference to accelerate learning of different engineering interdisciplinary. Shall prepare, plan, and organize the SHESS Midterm and Final Study-A-Thon at least once per semester. Shall organize at least 1 “Graduate School Information Session” event in fall semester in collaboration with the Graduate Student Ambassador. Shall attend the Fall, and Spring Organizational Development meetings and all other meetings required by the Center for Student Involvement (CSI). Be in charge of SHPE Junior Chapter Progress/Events. Document and describe all interactions with SHPE Jr. Chapter on End of the Year Report. Work with local student and SHPE Jr. Chapter presidents to foster a strong relationship between professional and student members. Shall organize all social activities of the chapter (Shakey’s Fundraiser, monthly soccer games, Corporate Tours, Off-Campus Activities, etc.…). Shall organize at least 1 “Noche de Ciencias” every year. Shall organize at least 1 volunteering event per semester. Establish and enhance the professional image of the organization, publicize for every function and activity inside and/or outside campus. Collaborate with the Vice President of External Affairs to organize social activities of the chapter (member relations, social activities, etc.). 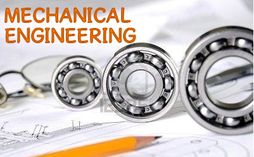 Be adamant on forming new industry and graduate student contacts whenever the opportunity arises. 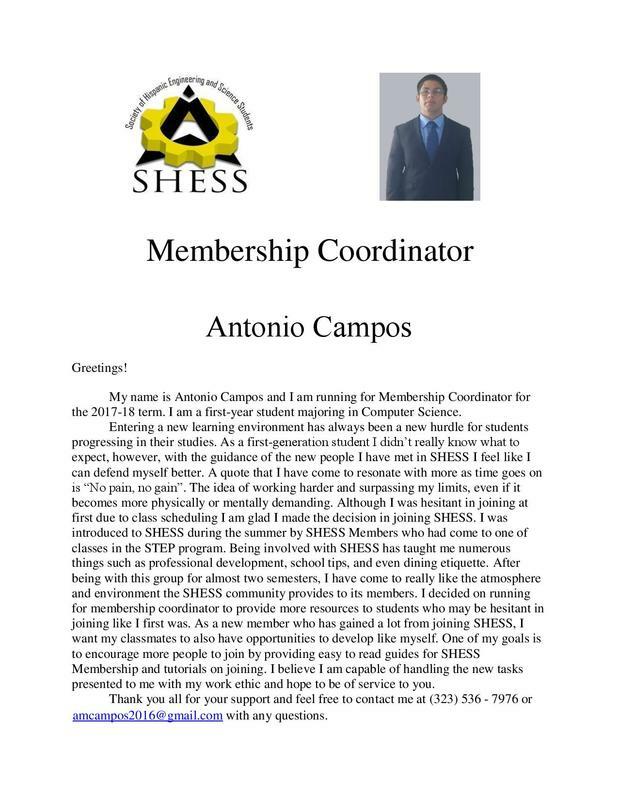 Must take pictures of all SHESS, SHPE, and ECST related events or activities; shall work with other board members to collect and gather all pictures and videos. Work with the Freshman Representative(s) to create a bi-annually album of pictures and a video. Must prepare and submit SHPE articles for the SHPE Magazine issues. Maintain E-board, and members informed of any special events, programs, etc. Maintain a timeline of events for the academic year. Shall research possible publicity events; and shall be responsible for all press releases to media (newspaper, TV, etc.). ● Shall have one (1) vote on the Executive Board of Directors. Shall be work with the Treasurer to maintain a record of all membership dues. Be responsible for tallying the Point System with the Secretary. Shall keep a synchronized/organized database of members with the organization and national office. Shall be responsible for keeping records of attendance (sign in/out sheet, etc.). Prepare a bound copy of membership of the organization. Shall keep record of past and recent graduating member contact information. Shall responsible for keeping track of the Membership, Board, and National Point System Sheet. 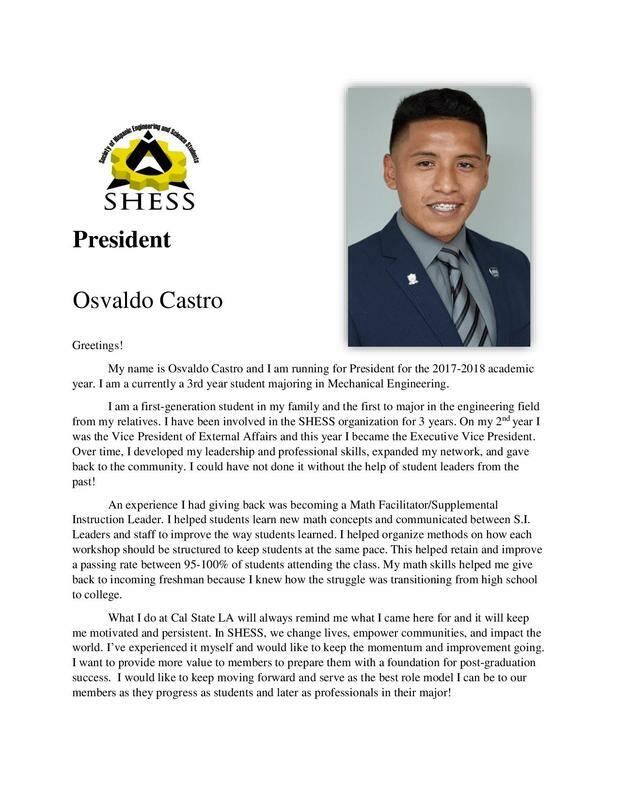 Prepare procedures, steps, and brochure demonstrating the benefits of becoming a SHESS and SHPE member. Shall be responsible of updating, debugging, and enhancing the organization’s website, and social networking tools. Shall update the SHESS website at least once a week in accordance with the NRP report. Shall post/share at least 1 new item on the SHESS Social Media page daily. Maintain and update all social media (Facebook Events, Twitter, Instagram, etc...) accounts and passwords. Must communicate with members for feedback to continuously improve the SHESS website and social presence. Submit link to SHPE Inc. and verify is submitted to nps@shpe.org for points. Shall be in charge of updating and maintaining the SHESS Bulletin Board and SHESS Tri-Fold Poster. Shall work with Vice President of Marketing/Public Relations to create a quarterly album of pictures and a video. Shall be responsible of informing the freshmen class of all of the activities that the organization will be undertaking throughout the year. Shall be responsible of ordering/ preparing food and refreshments for all of the Speaker Series with the help of the Treasurer. Shall invite all freshmen in the Summer Transition for Engineering Program (STEP) and Introduction to Higher Education (IHE) classes to attend the organization’s meetings, functions and activities. Shall be a graduate student. Shall work alongside with Academic Excellence Chair. Shall serve as a resource who can provide advice and pass-on knowledge/opportunities regarding graduate school, applications, and success as a graduate student in general. They shall serve as a non-voting advisor to the Executive Board of Directors.